The Vanco payment gateway will allow your attendees/registrants to pay for their event registration with a credit or debit card or a checking bank account or savings bank account. Need to Buy a Support License for the Vanco Payment Method for Event Espresso 4? Download the latest version of the Vanco payment gateway for Event Espresso 4 from your Event Espresso account page. Your credentials for Vanco will be assigned by a member of the Client Services team at Vanco. You’ll be provided with your Client ID, User ID, Password, and Encryption Key. That information can be entered in the payment methods page for Event Espresso within your WP dashboard and then click on the Update Settings button. You’ll then be ready to accept payments on your site. Note: Debug mode should not be turned on as your production (live) credentials cannot be used for testing purposes. If you need to test Vanco, then we recommend creating a couple of ticket options (pricing options) with a value of at least $3. The $3 minimum is set by Vanco. Then afterward, you can refund the funds. Will this be the only payment method enabled or the only one you offer? Click here to learn how to make it selected by default during the registration checkout. An account with Vanco is needed to accept payments via Vanco. Login to your WP-admin (WP Dashboard) and go to Event Espresso –> General Settings –> Payment Methods. Once on the Payment Methods screen, click on Vanco and click on the button to activate the payment method. Vanco Client ID – This credential is needed to process payments and can be found in your Vanco account, this is your Vanco Unique identifier for the organization. Vanco User ID – This credential is needed to process payments and can be found in your Vanco account, it is your Vanco 8 character Web Services user ID. Vanco Password – This credential is needed to process payments, it is your Vanco alphanumeric password. Your unique Vanco Encryption Key – This credential is needed to process payments and can be found in your Vanco account. It is a unique Encryption Key provided by Vanco for each user. Allow only Debit Cards – This allows you to set if transactions should only be allowed when a Debit card is being used. This will remove the option to pay via a Checking/Savings account and decline the payment if a Credit Card is used. The Vanco payment gateway will let you accept payments via credit or debit card or a checking bank account or savings bank account. It is a good fit for churches and other non-profit organizations. An account with Vanco is needed to accept payments via Vanco Payments Solutions, and an SSL certificate is recommended for securing your website. I configured Vanco and payments are not being processed. Can you help? Double-check your credentials and ensure that debug mode is off. Test mode (debugging mode) cannot be enabled with your production credentials that will be assigned by Client Services at Vanco. Also, ensure that there is no extra spacing before or after the credentials in the payment methods page of Event Espresso. When making a payment, there is an error message that shows ‘Blocked IP’, what is this? This means Vanco have blocked your servers IP address from their servers and you will need to contact the Client Services team directly to have them remove the block. This can happen if the incorrect credentials have been used within the payment method or if there is a problem during the login request to Vanco before a payment is initiated. First confirm that the credentials used are correct, if so contact your web hosting provider and confirm your server supports SNI (find out what SNI is here) as if not the login request will continue to fail and cause the IP to be blocked once again. 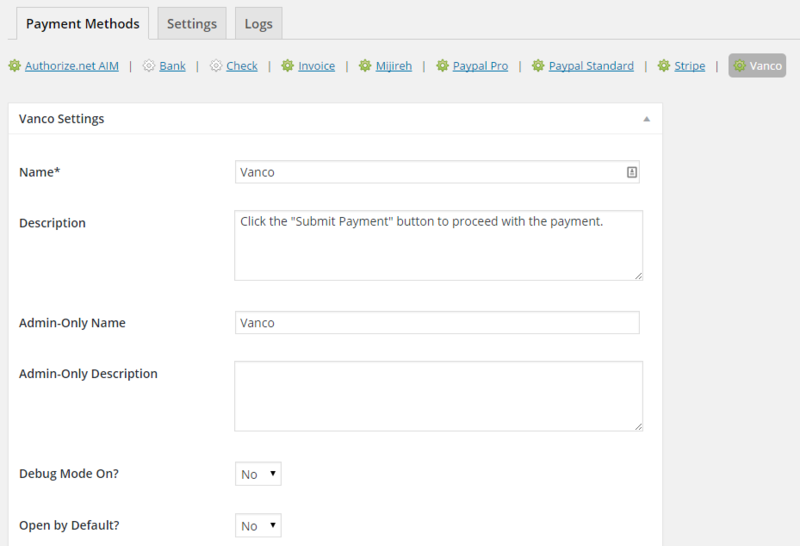 How can I set up a recurring payment or subscription through Vanco? Recurring or subscription payments are not currently supported in the Vanco payment gateway. When I refund a payment, does it also refund through Vanco? 2) Then login to your Vanco merchant account and process the refund. Is an SSL certificate needed for Vanco? View more information on PCI compliance from Vanco Payment Solutions.